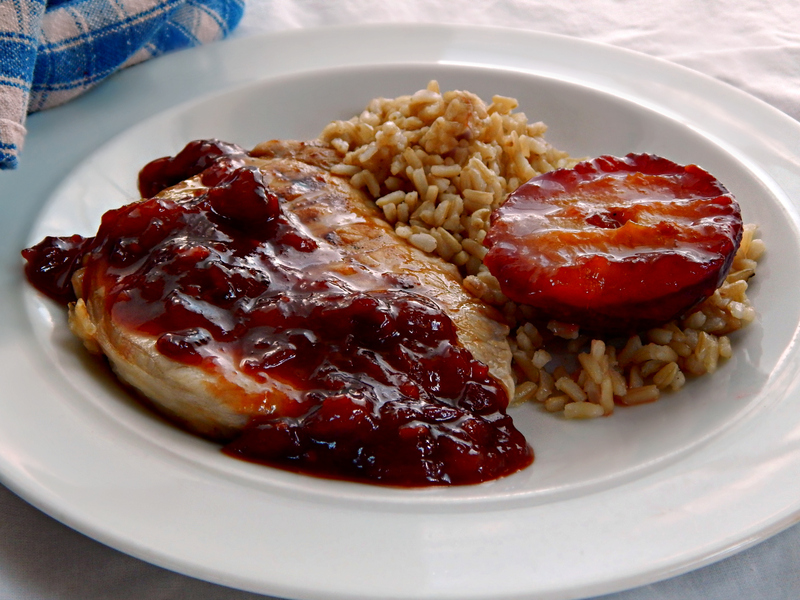 Pork Chops with Plum Compote is fast & easy enough for any old weeknight and special enough for casual company. You’ll just about want to lick your plate when you’re done; it’s that good. Just don’t do that if you do decide to cook this up for company! The plums really shine in this recipe. The Plum Compote is fresh, slightly tart, and slightly sweet. I love that flavor combination – it keeps the taste buds engaged! The flavors edge a little towards the Asian side and taste like a gorgeous fresh Asian plum sauce. The compote also doubles as the glaze which helps keep things simple. The grilled plums, though, just about steal the show. This was another recipe that is inspired (rather loosely) by the July/August issue of Midwest Living. Theirs was a kind of glazed, curried pork, but I’ve gone a little rogue and taken it in a fresher direction. If you’ve been following (and if you’re not, please do! I’ll email you each new recipe and never any “junk”) you’ll remember the Orange Apricot Snack Cake and the Chocolate Cherry Crisp I just posted recently. They were inspired the same issue. I always have to put on my own personal spin or add a few touches to make recipes better, less expensive or easier, though. Or all of the above! 🙂 But of course, I want to give credit where credit’s due, and I’m really enjoying my folk’s magazines! I can’t say enough how much difference a brine can make in a pork chop, in adding flavor and especially in keeping the pork moist. If you can only brine for a short time, there are those who swear even 30 minutes can make a difference. Longer is always better, though. The only thing I wish I would have done better was to leave the plums to grill just a bit longer so the grill lines were more distinct. They still tasted amazing. Buy your pork on sale when the whole loins are available at a low price – you’ll put out a bit more money up front but you can easily slice this budget meat into chops to suit your family. I like to go with a few thick chops, a few medium cuts and a few thinner ones like this, perfect for a weeknight meal. Watch for great sales in the fall and periodically throughout the year. I seldom see plums on sale in my area, but I do watch for sales on the other ingredients, especially the pantry staples. Honey is often at a low in the fall and I find great prices at my drug store, of all places, especially CVS and Walgreens of all places. Marmalade, as well as Jam and Jelly, are at a low in the fall. If you live near an Asian market and use a lot of soy sauce (and I go through a ton of it!) it’s well worth stopping in and checking their prices – usually, they’re amazing. And take a look around and see what else you might find! Pit and coarsely chop two plums. In a small saucepan, cook onion in 1 tablespoon hot oil over medium-high heat for about 4 minutes or until starting to soften, stirring occasionally. Add garlic; cook and stir for 2 minutes. Add chopped plums, ginger, lime juice, marmalade, soy sauce, ketchup, and honey. Bring to a simmer and cook, uncovered, for about 10 minutes or until onions and plums are tender, stirring occasionally. Remove from heat and let cool. Taste and adjust any flavors; depending on how sweet or tart the plums are, you might wish to add just a bit more honey or a little salt. Set aside about two and a half tablespoons of the mixture, using mostly the sauce portion, to use as a glaze on the pork. Preheat grill or grill pan. Half and pit the remaining two plums and set aside. Season pork to taste with salt and pepper and brush both sides with the reserved 2 1/2 tablespoons of glaze. For a gas or charcoal grill, place chops on the grill rack directly over medium heat. Cover and grill chops about 3 minutes then turn. Cover and grill another two to three minutes or until pork chops are lightly browned and pork is to desired temperature. While the second side of the chops is cooking, brush plums with honey and add to the grill, cut side down until heated through and a few grill marks are showing. Serve pork with grilled plums, remaining compote, and lime wedges. Note: Compote can be made up to a week ahead and kept, covered, in the refrigerator. Warm to room temperature before using. In a Ziploc bag, add 5 black peppercorns, 1 tablespoon table salt, and a tablespoon honey. Add a small amount, about 1/4 cup, of hot water, stirring to dissolve salt. Add the pork chops and enough cold water to cover the chops. Seal and place in a container in the fridge. Brine for one to four hours. I’ll be linking up Pork Chops with Plum Compote & Grilled Plums this week at our Throwback Thursday, Fiesta Friday & Saucy Saturdays. This entry was posted in Click here for Bargain Meals, Click here for Fabulous Food Posts and tagged Bargain Meal of the Week, Brine, compote, Honey, Jam Jelly or Preserves, Lime, Midwest Living, orange marmalade, plums, Pork, pork chops. Bookmark the permalink. It’s the weekend, and at my house that means trying a new food as part of my recently implemented initiative called Fun Food Weekends. It’s how I get munchkin to not be so picky about new foods. I’m not a huge fan of pork so I’ll use a substitute for the following meal, but it does look delicious and I’m dying to try the Plum Compote and Grilled Plums on the side. Thanks for the reblog and the shout out! You’ll have to let me know how your little munchkin likes it! Well, sounds absolutely wonderful I now know what I’m doing with my pork chops tomorrow night. Thanks for sharing. Thanks – I’m glad you like the recipe! I don’t have a lot of experience with plums. I know my dad likes them, but I cannot honestly say if I’ve ever tried one or not. I need to change that. This looks lovely! Oh, Carlee! They’re wonderful! Although for some reason I’ve eaten more plums than usual this year, I think. And I don’t know that I’ve ever used them in a savory sauce like this before but I know I’ll be doing more of that again! Oh wow, that looks soooo good! Pflaumen – 🙂 🙂 sooo delicious, will make this for myself very soon. Just will have to wait for my Hypermarket to import the (blue) plums. I think it would be good with any plums! 🙂 And thank you! Delicious meal. I’ve had plum compote and pork loin but pork chops would be even easier. I’m still swinging between a bit too rare and a bit too done. Never actually DRY but I’m never sure. I guess I should use a thermometer but there’s also the carry over cooking time to throw me off. My Mom always did a good job with it but I don’t remember ever cooking it with her. A lot of people use the crockpot, too.